Really motivated by your response, I am sharing another Excellent Advanced Level Problem (ALP) Question Bank of 100 questions (as per requests received from students) on Conic Section for JEE Main and Advanced (Download Link at bottom). You should cover the required theory before attempting this Question Bank as you may find it bit difficult to solve. Conic Section consists of three parts, namely Parabola, Ellipse and Hyperbola. Shifted Parabola, Ellipse and Hyperbola. Equation of Tangents and Normals to Parabola, Ellipse and Hyperbola in various forms. Geometrical properties of all the three curves. Parametric forms and equations with Auxillary circles. Various shortcuts and properties of all three curves. Once you have completed this question bank sincerely, I am sure you will face no problem in handling questions from this portion at JEE Main and Advanced Level. 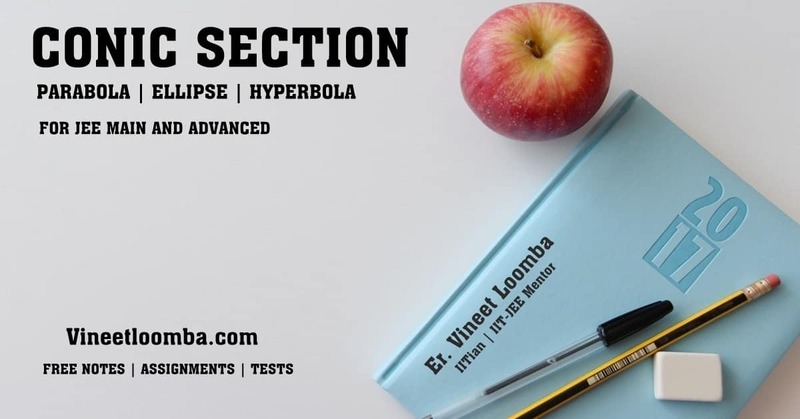 I will be updating more assignments on Conic Section Soon. Do give your feedback on how you find this question bank. Also comment any specific topics for which you want the study materials in PCM urgently. I am posting daily so stay tuned and dont miss out on posts. Click Here to Download this Assignment in pdf on your device. where are the answers sir ? These problems are too good. But it would be excellent to have the solutions since there are some problems which are really tough. Don’t worry solutions will be provided but at a later stage. You should discuss these among your friends and teachers. I am sure they will be able to answer these.